Patrick Hicks is the founding partner of the Nevada offices of national employment law firm Littler Mendelson and has been with the firm his entire career. Starting as summer associate in 1986, while still in law school, he was offered a full-time associate position with the San Francisco office in 1987. 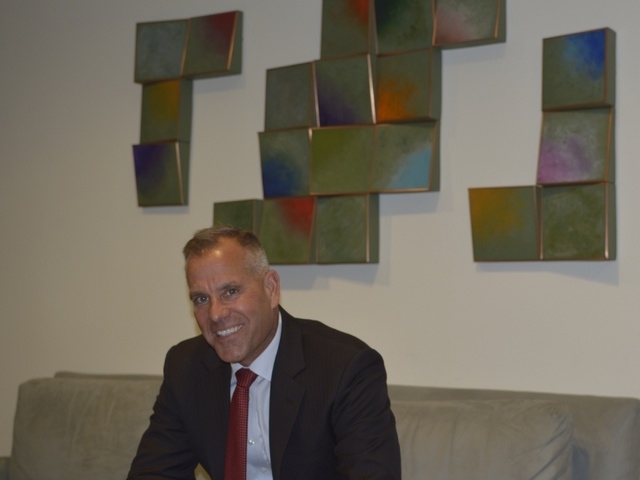 He opened the firm’s Reno office in the early 1990s and its Las Vegas office in 1996. Hicks is from Northern California and received his education at the University of California. He completed his undergraduate work at the Davis campus and attended law school at UC’s Hastings Law School in San Francisco. Hicks has served on the board of directors internally for Littler Mendelson and he’s serves as the liaison with several major insurance carriers. Q. What attracted you to employment law? A. Early in my career I asked one of my partners ‘what is it that you have found so interesting about employment law and has kept you in this arena for so long?’ And he said something that’s stuck with me for the last 28-29 years. He said ‘it’s passionate.’ If you have been discriminated against because of your race, or your gender, because of a disability or any other protected basis, you feel very passionate about vindicating and pursuing your rights. On the other hand, if you’ve been wrongly accused of discriminating against somebody, you’re equally passionate about defending yourself. So it’s an interesting area where there’s a lot of emotion involved and I find that adds to the experience. Q. You were recently recognized by the Human Resource Executive Magazine and LawDragon as one of the “most powerful employment lawyers.” How does that validation improve and/or challenge you? A. I’m flattered by the recognition, and I’m flattered by the fact that I’m the only employment attorney in Nevada under this category. But, I think the reason I’m flattered is mostly because it’s client-generated and my focus is on client service. There’s a lot of great lawyers out there. What takes it to the next level is the experience your client has with you and that comes down to client service. I strive to do that and being recognized for doing it brings some satisfaction. Q. What trends are you seeing in employment law? A. One is the challenge of whether or not an individual is an employee or independent contractor. That is an area where we see a lot of lawsuits; not just in Nevada but across the nation. It’s where the stakes are very high for the employers if they’ve misclassified employees as independent contractors. Related to that are other types of wage-and-hour class actions. There’s a variety of types of claims where individual employees are not allegedly suffering much individually but when you add a hundred, 200, 300, thousands of employees to the mix, the potential exposure for employers can be very large; and they’re not limited to any particularly industry. Every industry we represent has been touched by these wage-and-hour class actions. The second area where we’re seeing a lot of activity is lawsuits brought by the EEOC [Equal Employment Opportunity Commission] that they call systemic claims. So, it’s not just on behalf of an individual but on behalf of many individuals that could be impacted by a policy or a practice that employers have and we’re seeing a lot of activity in those areas. Q. How does the legalization of medical and recreational marijuana affect employment law? A. That issue, because it’s such a hot cutting edge topic, is also still being sorted out. For example, if an individual has traces of PCP and they get into an accident at work and the employer does post-accident drug testing, if that was a lawful use of marijuana then the question becomes can that individual be disciplined or terminated based on a product that’s in their blood system or still in their system that may not have impacted or may not have had any role in the causing of the accident. Those issues still need to be parsed and are being parsed in states such as Colorado, Washington, and Washington D.C. and states that have full recreational marijuana laws. Q. How do employers specifically navigate the medical aspect and patient privacy rights? A. Anytime you’re dealing with medial issues … HIPPA or just the right to privacy … employers have to be very careful about not violating employees’ rights to privacy. We in this office get calls on a regular basis for our client base about the specific fact patterns. The resolution is very fact specific. Q. How does the religious rights ruling against Abercrombie &Fitch affect the brand? A. It’s not uncommon for employers with fantastic brands to get sued for any variety of things. It’s not uncommon for those employers to either settle a case and sometimes lose a case before they settle a case. It depends, in large part, not just on the underlying allegations, but how an employer handles the response to the charges… I would be speculating … how it was impacted but I think all employers are generally cognizant of the fact that those kinds of accusations can negatively impact their brand and it’s one of the reason why they spend so much time and money training people on the front end to prevent those issues. Time has a way of healing sort of yesterday’s news but there’s no question that some brands have been damaged over the years … so I think employers are very cognizant of that and try to do the right thing. Q. Do you think with all of these different amendment issues coming up will we soon see Second Amendment and concealed carry rights in the workplace become an issue? A. It’s already an issue and it’s already one that we’ve answered questions about from our clients. There’s a Second Amendment, constitutional right to bear arms and many states — Nevada being one of them — will issue concealed weapons permits to individuals who go through and pass certain tests. That said, employers do have the right to adopt certain policies as it relates to firearms in their workplace and if done properly… you’re respecting an individual’s Second Amendment rights while at the same time having rules that govern the workplace that involve among other things safety. There’ve been policies drafted that the courts have looked at and said these meet what we believe to be the criteria but I do think that is an area we’re going to hear more about.